Greensboro City Hall is located at 300 West Washington Street, Greensboro NC 27401; phone: 336-373-2489. Photo: Bumpas-Troy House, ca. 1847, 114 South Mendenhall Street, Greensboro, NC. 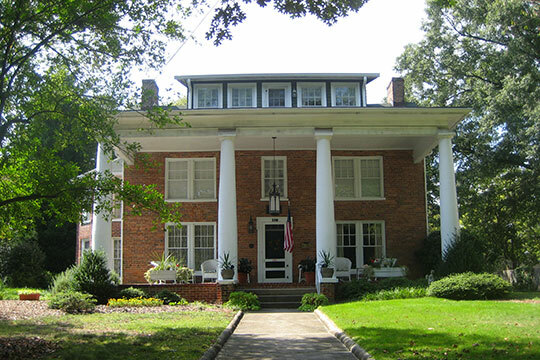 Listed on the National Register of Historic Places in 1977. Photographed by user:Rhpotter (own work), 2012, [cc-by-3.0 (creativecommons.org/licenses/by/3.0)], via Wikimedia Commons, accessed December, 2014. Greensboro, the County seat of Guilford, had [in 1902] a population of about twenty-two thousand. Situated on a plain slightly inclined toward the sunrise, is Greensboro, Queen of Piedmont Carolina. Surrounded by beautiful, undulating fields covered with soft Japanese clover, buffalo grass and abundant wild flowers, she is called the "City of Flowers." Once this section was prairie, it is said, but there are now tall oaks, poplars and elms of such strength and size as to suggest forest primeval. Greensboro, the Gate City, is the open door of transportation between North and South. This advantage alone would have made her strong industrially. Her hotels are famous. Her people are kind, cultured and hospitable. Her health is perfect. Greensboro, City of Flowers, Garden of Roses, Abode of the Birds, is the centre of Guilford County. One lucky morning in May, 1809, the Court of Guilford County was removed from Martinsville to the centre of the county, Greensboro. When Greensboro was made the chief town of Guilford County, Raleigh, as the capital of the North Carolina, was still very young; Wilmington was possibly a month's journey distant; Fayetteville, the chief trade centre for Piedmont North Carolina; and Hillsboro, almost royal in its degree of aristocracy. The great Highway between Salisbury and Hillsboro, leading by the little town of Greensboro, was traversed by stage coach, not hourly, as the trains pass today , but a lumbering stage coach drawn by six horses. A daily newspaper was something undreamed of, but unconsciously the stage coach driver fulfilled the functions of newsmonger as well as engineer, conductor, baggage master and expounder of the law and Constitution. The University of North Carolina, established in 1796, was not very old when Greensboro became a town. The first degree conferred by that seat of learning was upon a Guilford man, Dr. David Caldwell.